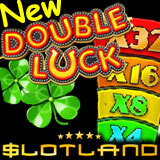 9 February 2012 (London, UK) – Slotland’s new Double Luck slot machine has an exciting bonus feature where players can double their winnings – not once or twice but five times. Until Sunday, players will receive a $27 free chip when they log in so that they can try this magical new game for free. Double Luck is a fanciful new video slots game with symbols of good luck like horseshoes and four leaf clovers on its reels. The scatter symbol is a gold coin and when it appears in any pay line it triggers the “Gamble” feature where the win can be doubled up to five times, multiplying the original line win up to 32x. Double Luck is a five reel, nine line game. Players can bet from $0.05 to $1 per pay line. Like all of Slotland’s no download slots and video poker games, it’s an instant play slots game with no downloading or installation required. Double Luck is Slotland’s 24th one-of-a-kind game and, like the others, it can only be found at Slotland. Players that are really lucky could find themselves listed on the site’s new dashboard feature alongside other recent winners. The dashboard also shows current bonus promotions and bonuses that have been applied as well as news about new games. Slotland’s progressive jackpot is currently nearly $130,000. No one can really predict when the jackpot can be won but since it is usually won before it gets much higher than this, it could be due for a big win any time now! Although Double Luck isn’t tied to the casino’s progressive jackpot, the other 23 games are.